Forget the coffee. Companies are setting up break rooms with video games to create a fun office atmosphere and--believe it or not--increase productivity. Admit it. You've played Solitaire, Minesweeper or another game on your computer at work before. And you probably felt a little guilty about it. But imagine a workplace where this kind of behavior isn't frowned upon, but is actually encouraged. Following the red-hot gaming trend--the U.S. video game industry reached $12.5 billion in 2006--companies across the country are designating office areas for the sole purpose of gaming. They're finding that not only do their game rooms help boost employee morale and solidarity, but they're also helping attract a younger workforce and increase productivity. In fact, according to a recent survey by WorldWinner, a subsidiary of FUN Technologies Inc., more than 80 percent of online gamers who play on and off throughout the workday said they are able to better focus on work after playing. A reported 72 percent actually rely on game breaks to help them deal with job-related stress. Luckily for them, gaming at work is becoming more accepted, and at some companies, it's the norm. "If anything, we tell employees to play more," says John Vechey, co-founder and director of PopCap Games. The Seattle-based "casual" computer and video game developer devotes an entire room to gaming. The room can be justified, since employees need to play PopCap games like Bejeweled and Zuma to make improvements and suggestions. "Our employees might be working less, but they're working smarter because they're thinking about how to make the games more fun," says Vechey. 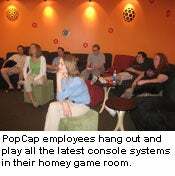 PopCap employees can even play from the comfort of their own desks by joining co-workers on a multiplayer game, like Halo, on the corporate network. Vechey admits the network games can become noisy at times. "I think it's a distraction when people are yelling across the office, and it's tough for the people who aren't playing the game," he says. But, overall, Vechey says he hasn't had any major issues. And, as he points out, the company's clients are proof that gaming on the job is becoming more acceptable in many different workplace cultures, including a convent where 80-year-old nuns play Bookworm and Bejeweled to relax and sharpen their mental skills. One of the most popular reasons for having a game room, aside from business purposes, is to build office morale. Scott Shamberg and Rod Rakic of Critical Mass, an interactive services firm, say their gaming room is not only a great recruiting tool, but is also the perfect place to interact with co-workers. The room is appropriately named "Hive," referring to the hub of activity, and includes large LCD TVs, satellite TV, a Dell XPS 600, iMac, Sony PSP, Xbox 360, Nintendo Wii, TiVo and more. When interviewing potential employees, Rakic and Shamberg show prospects the game room to give them a feel for the company and its culture. 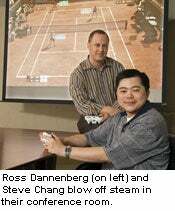 They say the room has helped attract younger employees, though they also point out that older employees who weren't gamers before are also being drawn to team-building events like the Calgary office's Xbox NHL 2007 Tourney. Aside from the social aspect of game rooms, they're also a place to relax at the end of a long day. For intellectual property attorneys at Banner & Witcoff'sWashington DC firm, gaming is the perfect escape from a long, grueling work schedule. "We work hard as attorneys, and we like to play hard," says Ross Dannenberg, a firm shareholder and an attorney who reports on intellectual property protection in the video game industry in his blog. The firm's gaming area is housed within the conference room, so attorneys have to make sure the room is free of clients and meetings before game time begins. Some nights, the attorneys continue playing even after they get home. At times, five to 10 attorneys from the Washington and Chicago offices will sign on at home to play and chat. But not all companies with game rooms deal specifically with gaming in their everyday work. Take Edmunds.com, an automotive information website, as an example. According to COO Avi Steinlauf, the purpose of their gaming room is to make employees feel more at home. "We want our employees to enjoy being here. The game room is very much a part of who we are and what we're all about," says Steinlauf. 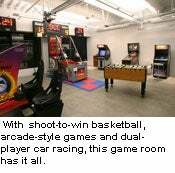 If employees want to take a break, they're encouraged to visit the room, which includes Pop-a-Shot basketball, arcade-style video games and an industry-appropriate, dual-person car racing game. If crowds become too large, employees can expand the room by raising the garage door that makes up one of the room's walls. Surprisingly, neither Steinlauf nor any of the other companies interviewed say they've had to implement any rules or regulations regarding their game rooms. According to Vechey, the only employees who might have trouble in this type of environment are the ones that can't regulate themselves. But, overall, the companies agree the positives outweigh any negatives by boosting office morale, creating a positive work culture and, as a result, increasing employee productivity.